How many times this month have you done a favor for a client? A favor could be making an exception to your normal policies/procedures, offering a discount, tailoring a program, or doing something extra for the client. Did you specifically let your client know they received a favor? Notice, the question is did you specifically let your client know. If you’re unsure or if you answered no to this question, then chances are your favor has no value to your client. And, more importantly, they may expect the same the next time they do business with you. In the mid 90’s, my first professional sales job out of college was working for a technology company. This was back in the days when the salesperson (me) would fill out a sales form and turn it into the Order Processing Department. Order Processing would check to make sure the form was filled out properly and enter the order into the computer system to bill the client and get the product shipped. Early on in my job, I’d become friendly with one of the people in Order Processing (for the sake of the story I’ll call her Janet). Janet would let me get away with turning my orders in a little after deadline from time to time and she’d fix little mistakes when I made one. She took very good care of me. As our company grew, so did the Order Processing Department. The new person hired in OP (I’ll call her Kay) started sending back my orders and requiring changes before she would process the order. The changes she was requiring were not ones I’d ever had to do before. At first, I assumed it was because she was new and didn’t really understand her job yet. After sending back my orders a few times, I got irritated, wondering why she wasn’t learning how to properly do her job. I went to my friend Janet to complain about the “new person” and how she was making it so difficult to get my orders processed. When Janet found out the correction Kay was consistently asking me to make, Janet said, “Oh, Kay’s right, you’ve never put your orders in correctly, I just always fixed them for you.” This had been going on for over a year. Janet’s intentions were good, however, I felt like a total idiot. Here I was thinking I was right and feeling irritated at Kay because she didn’t know how to do her job properly only to find out, I was the one not doing my job properly. It was an embarrassing and humbling experience. Even though I appreciated Janet’s attempt at doing me a favor, I would’ve preferred she pointed out my mistake so I learned to do it correctly. The favor has no value in building rapport or client loyalty when you don’t take the time to educate your client. The favor you think you’re doing for your client, may either go unnoticed or even embarrass your client when they find out about it and wonder why they were never told. When you take the time to do a favor for your client make sure you’re keeping your client in the loop. This isn’t about tooting your own horn, it’s about good communication, setting expectations and relationship building. 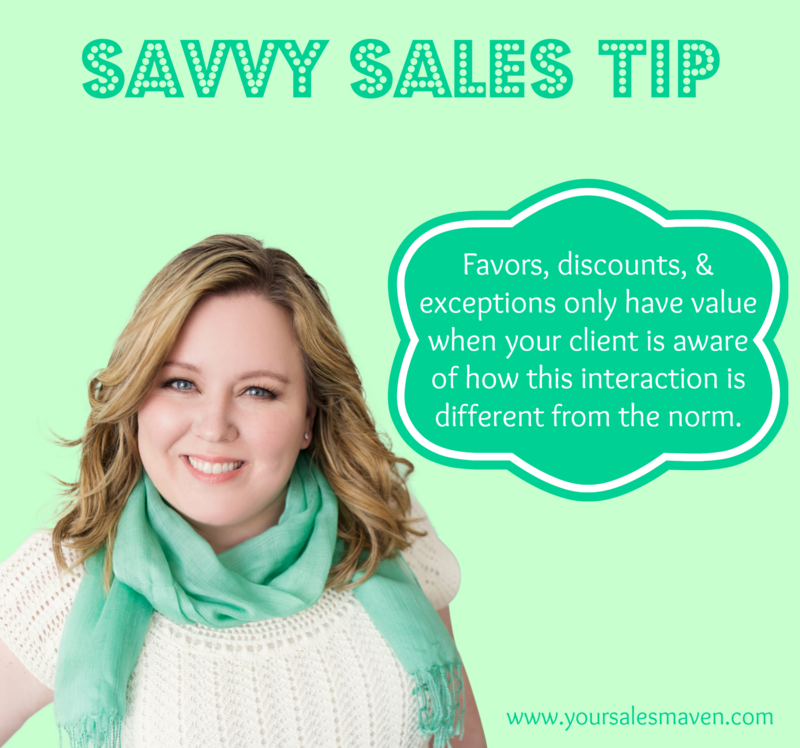 The Savvy Sales Tip this week: favors, discounts, and exceptions only have value when the client is aware of how this interaction is different from the norm. Here are 2 examples of how to inform your client of a favor. Take a minute and think of how you want to communicate with a client when you do them a favor. Having something prepared ahead of time will increase your chances of actually saying it in the moment. Wishing you continued success this week. Your questions, comments, and feedback are always welcome. fantastic publish, very informative. I’m wondering why the other specialists of this sector don’t realize this. I’m gone to convey my little brother, that he should also pay a visit this weblog on regular basis to get updated from most recent information. Thank you for recommending the site to your brother. of work? I am completely new to running a blog however I do write in my diary daily.